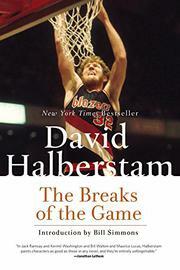 The game is professional basketball, as represented by the Portland Trail Blazers' 1979-80 season--a microcosm, in Halberstam's wide-angle rendering, of the commercialization of all that was once genuine in American life. . . at the cost, often, of human lives. (In pro basketball, of some of the best and brightest black lives.) The book has a problem with sprawl--not only because the central chapter, "The Season," goes on for 300 pages. Halberstam has contrived a narrative as seamless and fluid and intermeshed as basketball itself--with the result, in the first half at least, that lines of development don't stand out (and much has to be reiterated). But in time all the interesting things Halberstam learned about new-breed-millionaire owner Larry Weinberg, personnel manager Stu Inman ("Are you really telling me"--to Weinberg--"that you know more than us? "), coach Jack Ramsay ("the system came first"--and the blacks craved more freedom), about Blazer superstars and comers and might-have-beens, do add up--intellectually and emotionally. And what appear first as insights--the shifting of franchises from blue-collar basketball cities to white-collar market-places, the physically-punishing, career-shortening longer seasons, the frequent shuffling of players (college basketball, now, has more continuity), their overnight rise from ghetto or shack to (dissatisfied) superstardom--become episodes in an ongoing, unfinished drama. Among the highlights: maverick great Bill Walton has defected to San Diego, charging medical maltreatment--on the part of two of his closest associates, the Blazer doctor and trainer. (The issue is painkillers: he had compromised his principles so that, like his teammates, he could "play hurt"--and like others, injured himself further.) To compensate the Blazers for his loss, NBA commissioner O'Brien assigns Kermit Washington to Portland--despite Washington's handwritten plea to be allowed to stay in San Diego. (It would be his fourth city in three years--worse, it would mean, after a freak fistfight, "proving myself again.") Maurice "Luke" Lucas, the Blazers' remaining star and most intimidating presence, wants to be traded--with a no-cut contract, he'll sit out most of the season. "Unabashed square" and unexceptional player Larry Steele is going into a ninth, record Blazer season--before it's over, he'll have six knee operations to try to hold onto his job. Billy Ray Bates--"a child of the feudal South," now a Maine Lumberjacks guard (one of the great personal stories)--will join the Blazers and become NBA Player of the Week. And ABC's Roone Arledge, stung by the NBA switch to CBS into building up rival attractions, will have his revenge: the last championship playoff game will be shown on TV at midnight. Says Luke: "Can you imagine Kareem and Magic and Julius, and we're still second-class citizens?" No, you don't need to be a fan to start with--but you might be before you finish.